Palladium futures have met resistance at the top of the Ichimoku cloud, having bounced off the bottom of the cloud only three sessions ago. 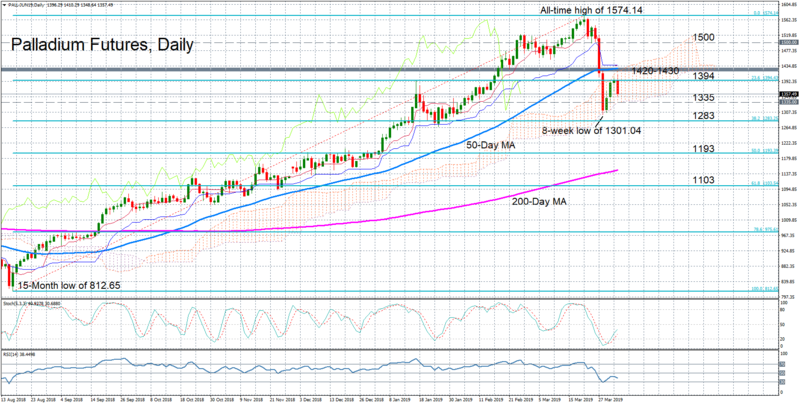 Prices plunged to an 8-week low of 1301.04 last week before recovering to around the 23.6% Fibonacci retracement of the August 2018-March 2019 upleg from 812.65 to 1574.14. Looking at the technical indicators, an extension of the recovery is possible as the stochastics are still rising. However, the RSI is pointing to a weakening momentum as its trending slightly lower below the 50 neutral level. Should prices manage to overcome resistance at the top of the cloud, which is also near the 50-day moving average, forming a strong barrier in the 1420-1430 region, there’s likely to be additional resistance at the 1500 psychological level. Clearing these hurdles would enable the bulls to re-challenge the all-time high of 1574.14 recorded on March 21. Setting fresh highs would reinforce the medium-term bullish outlook, which, at the moment, is at risk of turning neutral following the downward slide that drove price action inside the Ichimoku cloud. However, if prices are unable to break above the cloud, immediate support is likely to come at the bottom of the cloud, currently at 1335. Dropping below the cloud would shift the short-term bias to bearish and open the way for the 38.2% Fibonacci at 1283. Deeper losses would turn the focus on the 50% Fibonacci at 1193.